Crimson Peak is now showing in cinemas everywhere and is distributed in Australia by Universal Pictures. Guillermo del Toro's Crimson Peak has an incredibly creative and beautiful sense of self visually with it's atmospheric gothic recreation of nineteenth century New York and England. However, with no narrative sense of individuality or unpredictability, the film that would seem to be perfection at the hands of fantasy/horror master del Toro is an unfortunate mash up of past films and is so much so that it loses its identity as a story. Edith Cushing (Mia Wasikowska) has been confronted by the harsh reality of death in life since she was a young girl and has been haunted by the restless from beyond the grave since the death of her mother. She is quite taken by an English stranger, Thomas Sharpe ( Tom Hiddleston) who stirs up life in the New York home she shares with her father (Jim Beaver). A tragic turn of events leads Edith to accept Thomas' marriage proposal and move to his family home of Allerdale Hall in rural England which he shares with his hostile sister, Lucille (Jessica Chastain). Upon her arrival, Edith is greeted by many of the ghosts which haunt her new home and their presence opens a terrifying past that involves her new family. Gothic horror is often craved by cinema goers who want to experience the old-fashioned atmospheric mode of the genre that used to be so terrifying in the early days of cinema. Unfortunately this sub-genre has not seen much success in the past decade due to the observation that while the production design has got progressively better, the screenplays have lacked intrigue and creativity. The majority of successful and remotely original and unpredictable horror films seen in recent times have been those set in the present and reasonably low budget. Crimson Peak comes at a time when audiences are thirsty for a scary film with a historical backbone to it and with a stellar cast and Guillermo del Toro at the reins, was anticipated to fill the void. So there is a great deal of disappointment when Crimson Peak is incredible to look at, but predictable and does not hold suspense well right from the beginning. The film has a wonderful sense of identity through it's visuals. which does in fact make it a memorable experience. The production design by Thomas E. Sanders is absolutely exquisite, particularly of Allerdale Hall and it's interiors. Every room within the great house is visually intriguing with it's period appropriate features and perfect symmetry which make them delightful to behold on screen. The costume design by Kate Hawley is also most attractive. The design aspects of the film work incredibly well to give a superb nostalgic atmosphere and make it an aesthetic treat. The incredible design does seem a waste in a film that really isn't sure what it is. 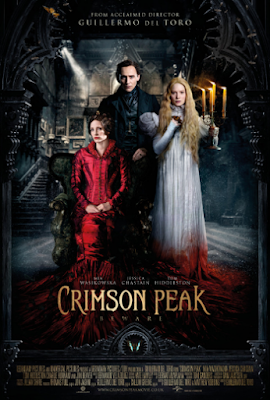 Like the book which Edith is writing, the film makers claim that Crimson Peak is not a horror film even though it has ghosts in it, but a gothic romance. If this is so, it is an example of a romance with minimal romantic chemistry or tension and very little reference to love between husband and wife, but more so between brother and sister. Crimson Peak could perhaps be classified more as a mystery with the inclusion of some terrifying images during it. The screenplay pulls inspiration from a number of horror films from the past and this leads even more so to it's lack of creativity and identity. The majority of comparisons story wise seem to be being made between Crimson Peak and the 1940 Academy Award winner, Rebecca. However, the comparison between the two is only fragmented after one gets past the idea that they are both set in big houses which a woman's new husband has inherited and the slight similarities of their pasts. 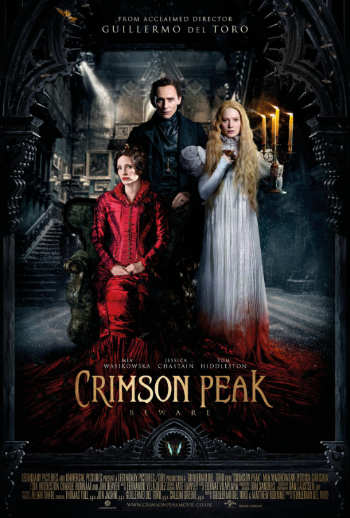 With some aspects of Rebecca, Crimson Peak becomes a story with the influences of other films such as The Haunting, The Woman in Black (or more likely from the novel the film is based on) and 1995's Haunted. Del Toro and Matthew Robbins screenplay feels more like a collection of pieces of other horror films thrown together and although it avoids feeling messy, does not feel creative or unpredictable in the slightest. The film relies more upon it's visuals of supernatural beings to create tension and suspense rather than it's story, which leads to moments of suspense being sporadic. While the screenplay brings the film down, the talented cast do the very best with what they are presented with. Mia Wasikowska does very well in her role as Edith Cushing with a real emotional edge to her performance and ability to grasp the inner terror felt by her character. Jessica Chastain embraces the cold and hostile nature of her character, Lucille Sharp and does not falter for a moment during the film out of her terrifying nature, while Tom Hiddleston is awfully charismatic as Thomas Sharp. Crimson Peak is incredibly intriguing and memorable from a production and design point of view, but lacks screenplay strength and originality. It's release time is perfectly scheduled to coincide with Halloween as if all else fails, it does provide some pretty terrifying ghostly images.